Germany & Austria Part III - January 8, 2009. Will someone please put on the heat around here? I am drinking cold Riesling all day long in -5º C weather. Germany heats their rooms with radiators, yes, radiators. Do you know how long it takes to heat a cold room with a radiator at this temp? We could make a killing installing heat pumps and vents in this country. After Frank Heyden, Derek lets me take an hour catnap as the diesel Peugeot gurgles off to Ockfen in the Saar region, and the Dr. Fischer estate. We are greeted by the smiling and friendly, Karen Fischer, head of winemaking at her family’s home. 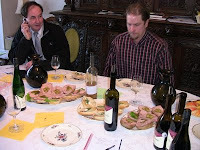 Sitting at the round tasting table in the living room/tasting room/office, we run through nine wines including tank samples of the 2008 vintage still working after harvest, and then a glorious 1973 Riesling Spatlese. More on that later. The funny thing about Karen’s wines- even the sweetish ones taste dry, and that’s her style. Lots of acidity in proportion to any residual sugar so the palate tastes nearly dry, or in many cases it is dry. The wines are aged in giant 1,000 liter wood casks, used year after year. The wood does not impart flavor b ut keeps the wines round and lets them breathe through the barrel’s pores over time. In the cellar we see these giant, dark brown/almost black casks sighing with the new 2008 vintage slowly coming to life. The yeast are doing their thang and I notice the dripping water and icicles on the ceiling as we are underground. Karen tours us through the “old” wines, laying in darkness like bones in a tomb. 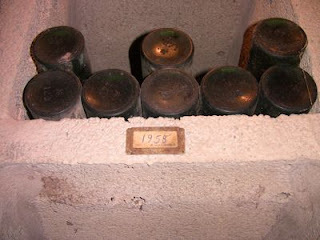 The bottles sit in cement cubicles with yellowed paper tags indicating the vintages: 1945, 1958, 1971, 1983... Some bins have just one bottle lying in wait. The corks are looking mealy, some bottles are leaking, ullage levels are low (air space in the neck of the bottle as wine evaporates) and the cobwebs and dust all make me feel like I am invading their privacy and peering into the opening of Egyptian tomb. Karen is gracious to pull one 1973 Spatlese and we go up to uncork it. The bottle is dead, so she makes a second trip to retrieve a replacement bottle and the nectar inside is a golden brown with tobacco and spritzy, lively acidity (after 35 years! ), cinnamon, orange peel, and tastes fairly dry. What a treat. 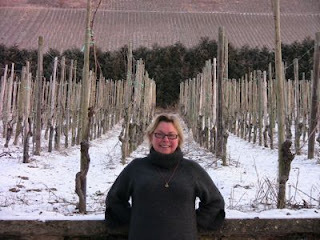 Her backyard is the famous vineyard, Bockstein and she lets me take a photo of her with her “children” in the background and her warm smile up front. 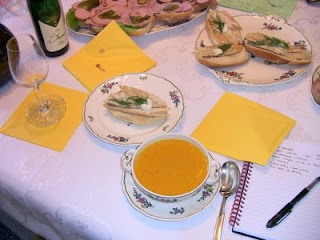 At dinner we discuss the new law allowing the use of just “Mosel” as a designation on a wine label. Previously, the wines always said: Mosel-Saar-Ruwer, encompassing all three areas. 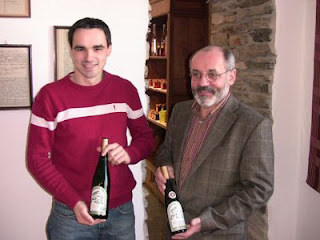 Today the Mosel guys use Mosel, the Saar guys use Mosel but add “Saar Riesling” to the label and the Ruwer? We’ll they are like me, left out in the cold of Germany. 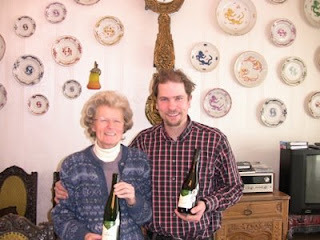 The Ruwer wines have to say Mosel and can’t use their name on the bottle. As a result the wines of the Ruwer are nearly extinct. Ah, wine laws. When someone figures them out, let me know. Wednesday morning we’re off to the Mosel region to taste with a new to me winery, Karp-Schreiber. We meet the son and father at the winery tasting room. Like Frank Heyden, Alwin Karp's son has gone to oenology school and is apprenticing with wineries around the world to bring back ideas. He has done a stint at Flower’s winery in CA and just got back from Spain. This winter he is about to leave for Australia while their German vines sleep in the winter cold. 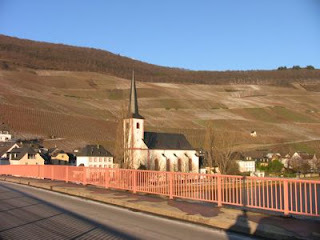 The winery was established in 1664 and today they have just 4.5 hectares of vineyards including part of the "Grand Cru" Juffer-Sonnenuhr vineyard. Outside their bay window I see the famous sundial in the Sonnenhur vineyard. The giant sun dial sits on the side of the hill for time keeping on sunny days, which is not now. The big joke in the town is when the newspapers announce that the dial has been changed from the winter to the summer correction, like our daylight savings. Apparently it makes the tourists ask lots of questions. I am presented with a piece of slate (soon to adorn our overly crowded coffee table at the wine shop back home) from this famous vineyard area with a small hole in the center. 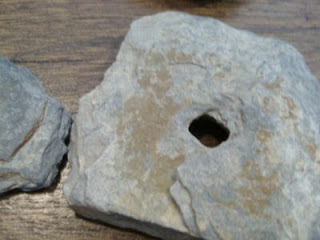 These fossils are from the works using hand tools to break the ground for planting many, many years ago (1700s) and the metal picks would puncture small pieces. The black and blue slate is a defining soil characteristic of the Mosel. It heats during the day from the sun and reflects energy back to the vines at night, it adds a flinty quality to the vines, and with the vineyard’s southern facing exposure towards the Mosel river, the climate is moderated for optimal ripening. This slate is also the roofing tile found on roof tops throughout the entire Mosel region. We plow through 16 wines this morning finishing. They are fantastic and completely different than the styles we have enjoyed so far on the trip. I am excited to bring a new winery back to NC this spring from the Mosel. We finish with the 2006 Juffer-Sonnenuhr vineyard Trockenbeerenauslese, or TBA for short. This wine is only made every few years and in small quantities. It is nearly always in a half bottle and wicked expensive. The selected grapes have suffered through Botrytis or Noble Rot, decreasing their moisture content and increasing their sugar ratios. The grape juice is so thick it takes much longer to ferment. This one is a carpet of honey, golden raisin, flan and a touch of caramelized pineapple. It’s a dessert on its own. The acidity is so high, that the wine actually finishes very clean and not syrupy, a work of art. comparison, his regular wines come in around 90º-100º and can be sweet. They let the grape must ferment for months as the yeast trudged through the sugar only to come up with 1% alcohol, a no go. Wanting to be helpful, I suggest the ancient technique of pouring in a Red Bull to jump start the yeast, but they had not heard of this used in Germany. I shrug. Hmm, guess the young Karp has more apprenticing to do. January 7th, 2009 - I arrive in Frankfurt safe and sound from the overnight flight. Germany is six hours ahead of North Carolina, so I need to stay awake until bedtime to avoid the jetlag. No problem I feel great. I get through baggage and customs, walk out the door to the curb and wham! The frigid, cold air fills my nostrils and goosebumps cover my skin. 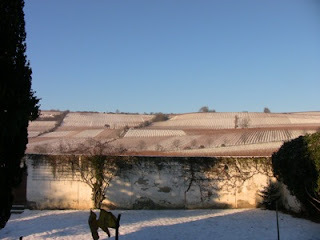 I meet our German Estates contact, Derek Vinnicombe and he quickly informs me that the day started at -16º C, but it’s already warmed to -14ºC so things are looking up. Derek came to Germany from England in the 1970s for “two years,” and never left. His English and German are perfect and he lives in Germany full time for his business. Derek helps us find the estate producers and is our contact for getting the wines exported to the US. He piles me and the baggage into the van and woosh were off on the Autobahn heading toward the Rheinhessen for the first tasting. Germany is the only country still without a speed limit on the highway. The Renault 4 cylinder fires away. It’s about 9 AM German time. As we drive, I make some small talk and say, “wow, there’s snow on the ground, is this normal?" Derek replies, “We haven’t seen snow here in years.” I reply, “so I guess the eiswein will be great this year.” “Oh, no,” Derek quips, “It’s too cold to make eiswein.” Hmm, I think to myself. Eiswein = Ice wine and it’s too cold. “So Derek, what do you mean too cold and first snow in years?” Derek explains this is the coldest weather Germany has seen in almost 30 years. At this temperature the grapes are like rocks and can’t be squeezed. It actually has to be warmer to make eiswein. I am quickly surveying my suitcase clothing in my head. Jacket, hat, gloves, socks, long underwear.... I hope I will be covered...literally! Our first stop is in Oppenheim with the young, dynamic rock-star winemaker, Frank Heyden of Dr. Heyden vineyards. These wines are a favorite of ours and Frank has recently taken over the winemaking from his father to completely re-invent the estate. His passion, enthusiasm and energy are boundless and we truly appreciate all that he is doing to make changes. Not too long ago the Rheinhessen region was a dying wine region. The old wine producers were stuck in their ways and the wines were decent, but not stand-outs. Then along comes the new guard, people like Frank, and suddenly the Rheinhessen is the talk of Germany. Frank has traveled the world to see how other regions make wine. He brings back ideas, concepts and new techniques to improve the family wines and takes the wines in new directions. Very exciting stuff, and he always has that sort of devilish grin when I ask questions like, “you aren’t planning on making a sekt (German “champagne”) too are you Frank?” And he disappears into the winery only to come skipping back with a bottle of Brut Prestige Riesling Sekt which is dry, fizzy and simply fantastic to drink. And I was only joking. And Frank is younger than me. I hate when that happens. Frank takes me through no less than 13 wines before lunch. I taste current vintages, and tank samples of 2008 not yet in the bottle. His Dornfelder (red wine) is a blockbuster! I have never had such powerful, intense and beautiful Dornfelder, or German red wine for that matter. This stuff is deep reddish, purple in the glass and I immediately think of zinfandel sans high alcohol or oak. Spicy, peppery, juicy and totally dry, Frank has that grin and explains for years Dornfelder was the bulk, grocery red, junk wine produced by many large wineries. It’s the sort of “white zin” of Germany (my words, not his). But Frank sees potential after visiting Burgundy and Romanée-Conti, and how they train the vines on single canes. So Frank being Frank comes back to Germany to take a vine that normally produces 200+ hl/ha of juice and crops it down to 85 hl/ha or less. [A vineyard will boast about taking less fruit, but higher quality fruit from their vines. The amount of fruit the vines are producing is measured in how many hectoliters of juice per every hectare (2.47 acres) is pressed. The lower the volume of juice, the lower the yield and theoretically the higher the quality] And that’s just one example of his innovation. Frank is also a serious red wine maker and makes outstanding Pinot Noir; the new 2006 Pinot is marvelous. The price is holding thanks to the Euro weakening so we hope to have some 2006 in Wine Authorities soon. We have sold two shipments of his 2005 in our first year of business. The 2008 rosé is this tank sample state is very pale and almost whitish-pink. Frank says that Blanc de Noir (white wine from a red grape) is fashionable in Germany right now, and what do I think about keeping the wine light? I love the flavor and aromas, but explain that we have a tough enough time teaching that not all pink wine is sweet and we stock the dry pink ones. Now you want me to sell a white Pinot Noir blend to people? And in about 2 minutes we all agree to make the wine pink like last year. Frank will be bottling the 2008 rosé for us in two weeks. Expect to see it late spring at Wine Authorities. And the morning carries on to whites until we have to break for lunch. January 6, 2009 13:41 - Crucial first part of the trip to Germany and Austria has been accomplished. 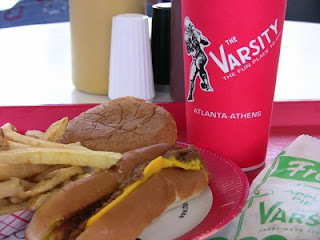 I had my first meal at The Varsity in downtown Atlanta. Key planning put me into Atlanta with a four hour layover before flying out to Frankfurt, plenty of time to grab lunch. A 20 minutes ride on the MARTA train from the airport to the North Avenue stop put me within a 3 minute walk to The Varsity, the worlds largest drive-in. If you haven’t been, they have been family owned since 1928 and the place covers two acres of land. On a Georgia football day, they serve 30,000 customers and over two miles of hotdogs, 300 gallons of chili, 5,000 fried pies and they are the worlds largest Coca-Cola outlet. I already knew what I wanted as I approached the shiny stainless steel counter tops. The row of red paper boat-hat cashiers were waiting for customers as they filed in. When a cashier has a pause with no line in front of them, they start to yell out the signature “what’ll ya have? what’ll ya have?” That’s your cue to jump up and shout your order. I went with the combo deal of: chili cheese dog, chili cheese burger, F.O. (don’t call it a frosted orange), fries, and hot fried apple pie. About three minutes later, I took my red tray back to an open table, gathered plenty of napkins and sat down with the bountiful goodness. These are actually small portions and I can see why someone with a bigger appetite would order two or three burgers at a time. They are only slightly larger than a “slider” which is about two bites. I grabbed the gynormous squeeze bottle of ketchup on the table and slathered the fries before digging in. The Varisty experience was enriching and girthening.